When it comes to maintaining beauty gear, you probably know you should clean your makeup brushes—but what about the rest of your tools? If you’re spending your paychecks on the latest curling wand or high-end makeup brushes, taking the extra time to clean them each month can extend their life, save you money, and help prevent future breakouts. Most of us stick to a daily face-washing regimen to prevent breakouts — often caused by bacteria. But what about those brushes we swipe all over our skin every morning? Buildup of oils, pigments, and bacteria collect on your favorite brushes—pretty scary considering 45 percent of women claim they never clean their makeup brushes. Not only can the dirt clog pores, but letting all that gross stuff collect on brushes for months can permanently damage the bristles. Brushes made with natural hair, which tend to be pricier than synthetic, can last a lifetime if cared for properly. Pigments will stain synthetic bristles more easily, but since those brushes are cheaper, it’s best to replace them every couple of years. Both types of brushes can be cleaned the same way. To clean: Deep clean brushes once a month to remove any icky buildup. If you don’t have a brush cleaner (which can be purchased at your local drugstore or specialty makeup store) then dishwashing liquid is a great standby to cut through the grease. Swirl your brushes in warm, soapy water, then rinse thoroughly with warm water until the water runs clear. 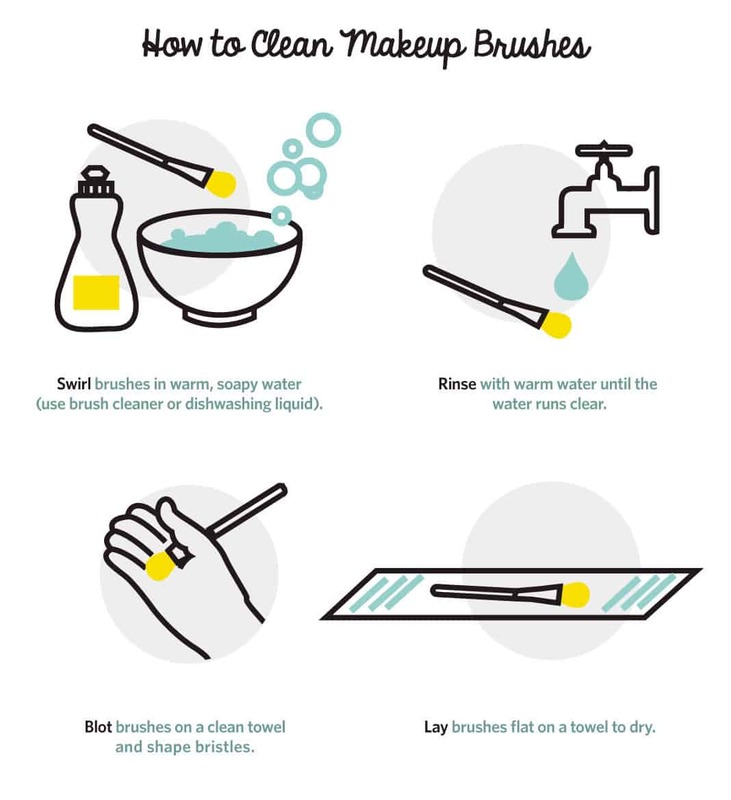 Blot each brush with a clean towel and shape bristles with your fingers. Don’t dry the brushes standing up since the water can wear away at the glue holding the handle and bristles together. Instead, lay them flat on a towel to dry. No time for a full cleanse? Quickly rinse tools, then kill any bacteria with a spritz of witch hazel. It’s likely many of us have hair tangled in our hairbrushes at this very moment. While a few strands will hardly damage those bristles, a thick coating can collect dust, conditioner, oil, germs, and even dust mites. If you want to keep your hair clean for longer and extend that blowout, it’s a good idea to clean hairbrushes frequently to prevent the transfer of oil and dirt. 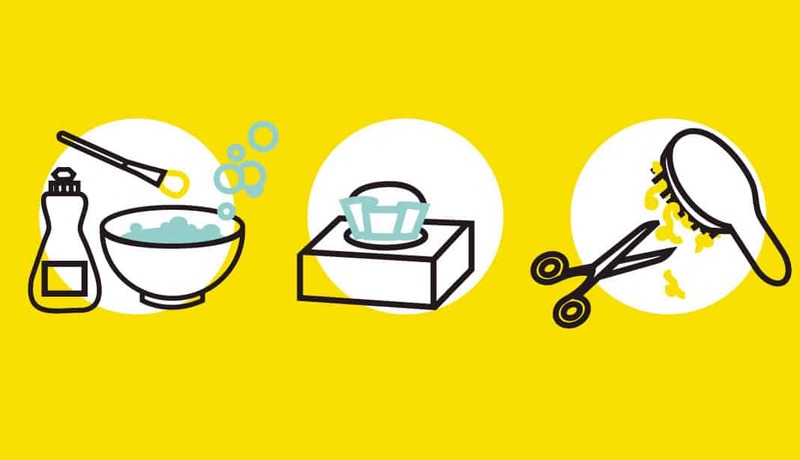 To clean: Remove any hair with your fingers. If there’s too much, use a pen or toothpick to dig underneath the layer of hair and lift it out. Scissors can cut down the hair to help remove it more easily, but make sure not to cut any of the bristles. Use a toothbrush to get any tiny hairs left behind. 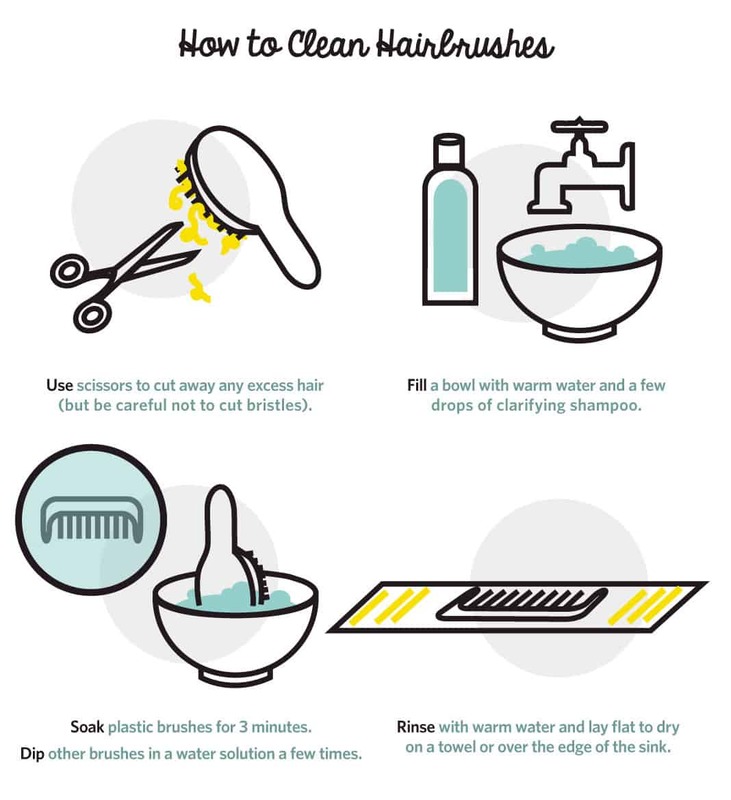 Fill a sink with warm water and a few drops of clarifying shampoo. If the brush is plastic, soak it for roughly three minutes. Do not submerge the brush if it has a fabric cushion; instead, dip it in the water a few times. Rinse with warm water. Towel off the brush and lay it flat to dry, with bristles over the edge of the sink or on a towel. As with makeup brushes, don’t dry brushes standing up in order to prevent water damage. If hair seems to take forever to dry, the filter in your blow dryer may be to blame. A clogged, dirty filter can reduce airflow and create strain on the motor, reducing performance and life of the tool. Detach the filter screen if the hairdryer permits and remove any trapped hair or dirt. If you use heat protectant spray (and you should!) before styling, then curling irons or straighteners have probably collected some grime over time. While it may seem harmless, product buildup can burn hair and lead to more split ends. To clean: Heat your tool for a few seconds, then unplug it (the warmth will make the grime easier to remove). Dip a cloth in rubbing alcohol and wipe metal plates. Dry immediately with a fresh cloth. 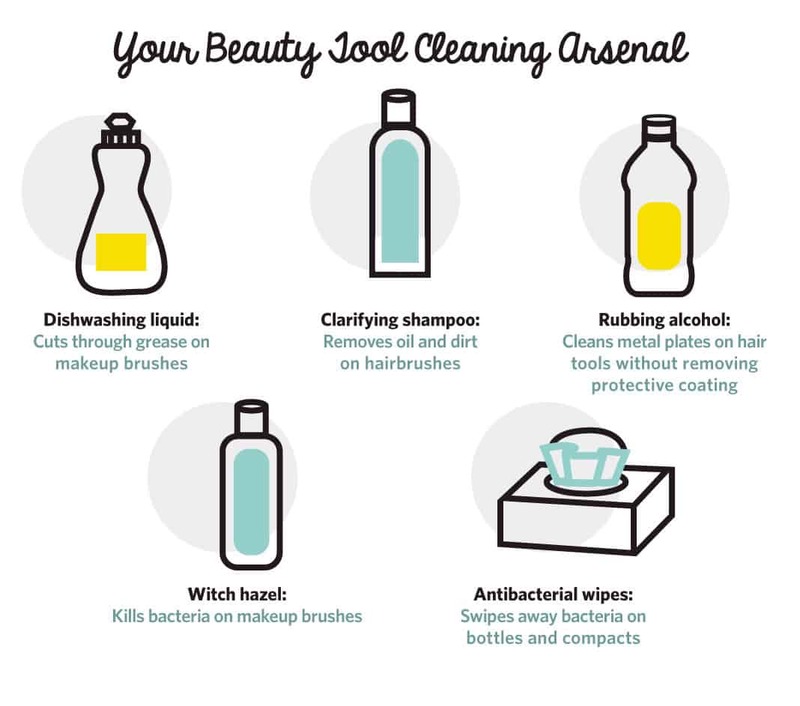 How often should you clean your hair and makeup tools? It depends how often you use them. If you flatiron your hair every day it’s best to clean the straightener once a week. If you use it two or three times a week, once a month is fine, and that goes for makeup brushes as well. Don’t forget about packaging and compacts: Keep them looking luxe by wiping them down with antibacterial towelettes. This will also prevent you from transferring the dirt and residue on the compact to your face.